Thailand is an enigmatic country! While on the surface Bangkok might look similar to any other modern city, when you start to interact with the locals, the deep cultural differences lurking just below the surface will immediately become apparent. To many Westerners, Thais sometimes react in surprising and unexpected ways. They may smile when you get angry; they may go seriously out of their way to help, or flatter you when it is seemingly unjustified; and in the most stressful situations they never seem to lose their cool. Although the vast majority of Thais are charming, gentle, and tolerant, not every visitor feels entirely at ease due to unfamiliarity with key elements of Thai etiquette. Foreigners sometimes misunderstand their passivity, or the fact that they do not always give direct answers, or become irritated by their apparent smugness. However, Thai behaviour is rooted in the way they view the world, which is influenced by their beliefs, culture, and traditions. Understanding these will go along way to helping you enjoy your visit. Culture Smart! Thailand will help you to do more than just see the sights. 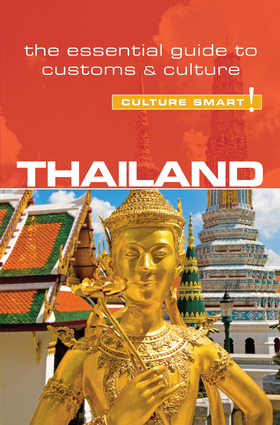 It will introduce you to the Thais at home, at work and at play and brief you on all the relevant social and business etiquette. There are concise chapters on the customs, values and attitudes and the key historical events that have shaped them plus a range of handy tidbits to help you avoid any embarrassing faux pas! The idea of "going Dutch" and splitting the bill is completely alien to Thais. If you invite a group of Thai friends out for lunch or dinner you will be expected to foot the bill, and vice versa. You can beckon the waiter over with your fingers pointed downwards.